Tecan has used its extensive knowledge of clinical and regulated environments and years of expertise in the field of automation to bring you the Fluent Gx, the fastest, and most flexible, open platform we’ve ever made for these highly controlled applications. The Fluent Gx is designed with clinical and other regulated environments in mind, offering the necessary tools you need to achieve compliance. The Fluent Gx automation workstation is designed specifically to meet the needs of regulated laboratories, with the advanced process security features required for applications in clinical, GMP and QC facilities. It combines all the liquid handling and workflow benefits already familiar to Fluent users – high on-deck capacities, fast processing and intuitive operation – with the Fluent Gx Assurance Software, a suite of software features needed to comply with stringent regulatory requirements, including FDA 21 CFR Part 11. Need help implementing Fluent Gx in your laboratory? Do you know which regulations affect laboratory automation? Tecan’s experienced global regulatory team is ready to help. The built-in touchscreen interface guides users through daily tasks for fast, consistent operation, with integrated user management – including method permissions – to ensure secure protocols and optimized selection for each user. Identification and tracking of samples, tubes and plates allows safe and confident processing, and Method Recovery functions enable process runs to be reinstated even following events such as a power cut or computer crash. With its exceptional deck and below deck arm access, Fluent Gx can accommodate multiple devices without expanding its footprint. Enjoy true walkaway operation with the seamless integration of complementary peripherals, all fully managed by FluentControl™. Fluent Gx's patented Dynamic Deck™ allows the high capacity worktable to be freely configured and easily reconfigured. A lower deck level allows devices to be integrated into the deck space, extending the vertical range even for bench top systems. Three independent, task-specific arms move in parallel to simultaneously and efficiently automate methods. Sample preparation, movement of labware to peripheral devices, and plate to plate or reagent additions can all occur in parallel — maximizing workflow performance. By offering a choice of both air- and liquid-displacement pipetting technologies, the Flexible Channel Arm™ provides excellent flexibility to suit the needs of your laboratory workflow. Increase productivity even further with dual Flexible Channel Arms using both pipetting technologies on 16 separate pipetting channels. High flexibility, high productivity plate pipetting. Swap adapters in seconds to switch from fixed to disposable tips or from 96- to 384-well formats. Pick up rows or columns 96, 384, and even 1,536-well plates to pipette serial dilutions, titrations, standard curves, controls, and more! Smoothly and quickly delivers labware – including plates and tubes – to the instrument’s pipetting arms and integrated devices without interrupting the pipetting process. Fluent Gx's unique Finger Exchange System™ automatically switches between tubes or plates and vertical or eccentric plate handling. Fluent ID™ enables simple and safe, high capacity sample identification and tracking. This scalable and upgradeable tube identification module accommodates 192 to 768 sample tubes per batch. The efficient, user-centric load-and-go operation and support of limitless batch reloading ensures complete confidence and high productivity. User management can be linked to Windows® Active Directory to manage Fluent Gx operators, key operators and administrators. FluentControl’s Audit Trail tracks all log-ins, changes, runs and results with electronic signatures. Data Audit and File Checker tools make it easy to search and verify compliant usage. 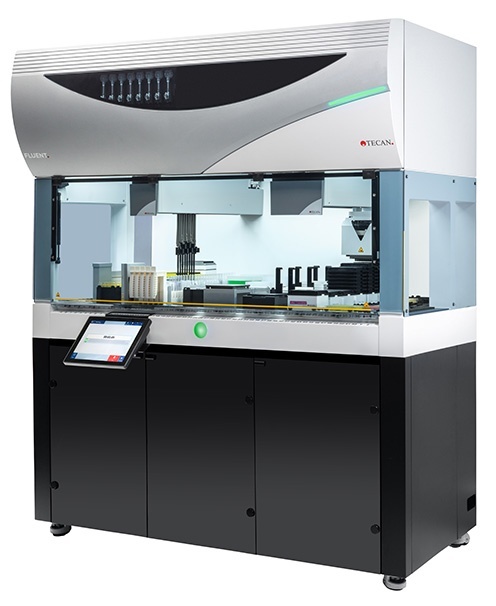 The Fluent Gx offers fully automated nucleic acid quantification and normalization – using either fluorometric or bead-based techniques – ensuring standardization of samples to your target concentration for storage or processing. Use FluentControl to write methods for virtually any genomics application, with dedicated commands for creating standard curves, DNA/ RNA normalization, etc. Tecan disposable tips are validated on Tecan instruments, guaranteeing optimal performance of the entire system. Instrument Qualification and Operational Qualification (IQ/OQ) of your system with Tecan disposable tips ensures the system always performs at its best – a clear advantage for your lab. Tecan Microplates are the latest addition to the Tecan consumables portfolio. We offer a selection of polystyrene, medium-binding ANSI/SLAS-format microplates compatible with Tecan instruments. Rapid technology advances have made NGS a cost-effective alternative to PCR or array-based techniques for many applications, allowing pooling of hundreds of samples in one sequencing run. The speed, accuracy and precision of Fluent Gx make the system ideally suited to preparing NGS libraries from multiple 96- or 384-well plates. Benefit from Tecan’s extensive experience in automating NAP kits to configure the ideal solution for your magnetic- or filter-based purification methods. Fluent Gx provides scalable solutions to match your throughput needs, with the flexibility to switch between random access samples, 96-well plates and 384-well formats as required. Integration of a thermocycler enables automation of your PCR set-ups, allowing reaction volumes to be reduced and simultaneously delivering increased throughput and reproducibility. Even common laboratory routines benefit from Fluent Gx’s amazing speed, phenomenal deck capacity and process security features. Fluent Gx is Tecan’s fastest, highest capacity, open platform for regulated environments. Enabling more tubes per run, in less time, all while tracking sample IDs, reporting pipetting results and checking viability in real time with liquid level detection. Fluent Gx brings the proven performance enhancements of the Fluent Laboratory Automation Solution to highly regulated laboratories. Application workflows in clinical and other regulated areas can benefit from high throughput, ease of operation and outstanding precision & accuracy with maximum process security. Tecan disposable tips are validated on Tecan instruments. Tecan Microplates are the latest addition to the Tecan consumables portfolio. The Fluent Gx is an open automation platform product for general laboratory use. It is intended for routine laboratory tasks, such as general purpose pipetting and general purpose liquid handling and robotic processes. Not all options are available in all markets. Certain options when combined with Fluent are for research use only. Configuration of options may impact intended use – please consult your local Tecan office.